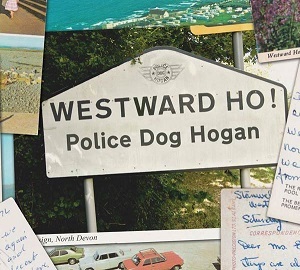 Police Dog Hogan - Westward Ho! Police Dog Hogan is an 8 piece band who between them play a wide variety of instruments including Gutiar, Mandolin, Accordion, Banjo, fiddle and trumpet. They're one of those bands that are hard to describe as they really do draw from various genres to create their music. Americana, Folk, urban bluegrass and more all play a part in influencing the music of Police Dog Hogan. As you'd expect from that description, their music is varied, but what the description doesnt tell you is just how good they are. When I first listened to the album, I hadn't read anything about the band so had no idea what to expect. What I heard was so good that before I realised, I'd listened to the album 3 or 4 times in a row. Calling them "Americana" might be a reasonable description musically, but with songs such as "West country boy" and "Crackington" it's clear this is British not American, so it's more a British variant on Americana. The vocals are great - they do remind me of Chris Rea at times, and sound good with fast or slow songs alike. The vocals are more than matched though by the superb music - really there's nothing to fault with this album. With it's fiddle, "From the land of miracles" has more of a Celtic feel. The fiddle and drums are the main instruments here but the trumpet also shows its presence. It's nicely done - I'd expected the trumpet to cut through the sound of the other instruments more but it actually fits in perfectly. "Ethan Frome" is the title of a book published in 1911, and the song lyrics talk about the book and title character. "Judgement day" is one of my favourites on the album. With its fast pace driven by the banjo and fiddle it's a great tune. The lyrics sound like they belong in a gospel song, so to hear them with the fiddle and banjo is an interesting mix and one that works very well. "Home" is a song that deserves special mention. It was recorded with Platform 7 - a group made up of ex-convicts as part of the Music in Priisons charity. It's not just that it's a good cause that merits mention, it's the fact that it's a great song. Normally the presence of a rap would have me reaching for the fast-forward button, but here it just feels like it belongs and actually adds to the song. The CD itself also deserves mention with it's handwritten title and band name along with stamps and an Ilfracombe postmark - a nice touch to make the disc stand out from all the others.